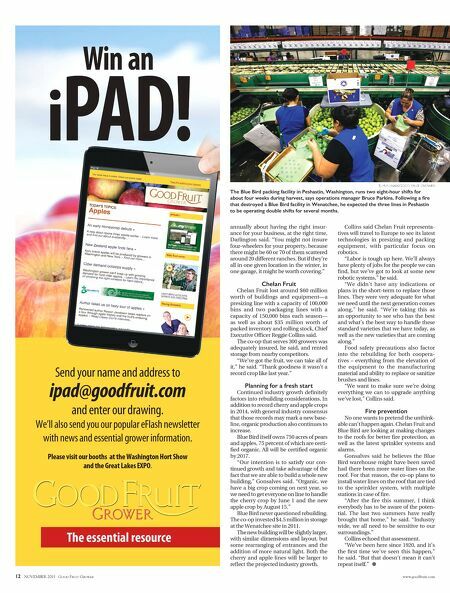 www.goodfruit.com GOOD FRUIT GROWER NOVEMBER 2015 13 New products are reported to slow browning and reduce microorganisms on fresh-cut produce. by Geraldine Warner A U.S. Department of Agriculture scientist has developed a sanitizing wash formu- lated with natural compounds that could help reduce foodborne illnesses caused by Escherichia coli, Listeria, or Salmonella on fresh-cut produce. Food processors sometimes use chlorinated water or hydrogen peroxide-based washes to sanitize produce, but they are not always effective, according to the USDA. At home, washing produce before slicing it can help reduce the risk of illness, but bacteria can persist in cut pieces. D r . D i k e U k u k u , food technologist at the A g r i c u l t u r a l R e s e a r c h Service's Food Safety and Intervention Technologies U n i t i n W y n d m o o r , Pennsylvania, has devel- oped a wash containing nisin, which is produced by lactic acid bacteria that are used in making buttermilk, cheese, and yogurt. Nisin is classified as Generally Recognized as Safe (GRAS) by the U.S. Food and Drug Administration. Ukuku found that nisin, combined as a wash with sodium lactate, potassium sorbate, and EDTA (ethylene- diaminetetraacetic acid) disodium salt dihydrate (which is commonly used as a preservative in processed foods and soft drinks), reduced the microbial populations without affecting the appearance, odor, or acceptability of the fruit. The wash, which he calls Lovit, could be formulated into a spray and used by processors, restaurants, or oth- ers concerned about food safety. Although Ukuku used primarily cantaloupes for his research, he found that the wash also slows browning on fresh-cut apples and enhances freshness of pears. He is patenting the wash and has a commercial partner interested in marketing it. Cal Poly Meanwhile, scientists at California Polytechnic State University have developed a method to prevent brown- ing of fresh-cut produce while also reducing the growth of aerobic bacteria, yeasts, and molds. The formula, developed by Dr. Wyatt Brown and colleagues, contains calcium ascorbate, calcium propi- onate, and calcium chloride. When applied to fresh-cut Granny Smith and Fuji apples, it prevented browning and growth of microorganisms for at least 21 days with- out altering the nature of the apples. Cal Poly obtained a patent for the formula this year and is seeking licensees to commercialize it. 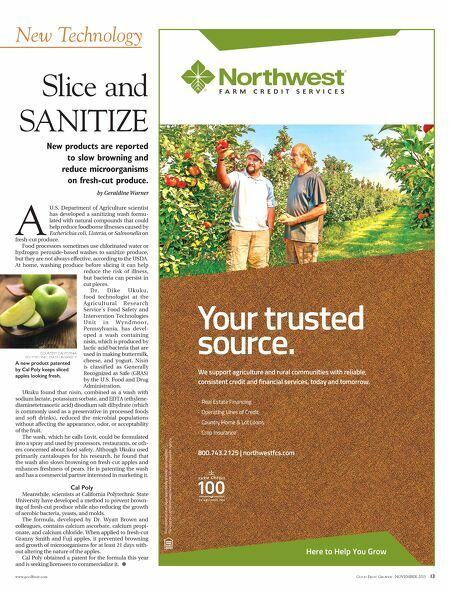 • Slice and SANITIZE New Technology COURTESY CALIFORNIA POLYTECHNIC STATE UNIVERSITY A new product patented by Cal Poly keeps sliced apples looking fresh. This institution is an equal opportunity provider and employer. *Serviced through Northwest Farm Credit Services Insurance Agency. Here to Help You Grow Your trusted source. 800.743.2125 | northwestfcs.com · Real Estate Financing · Operating Lines of Credit · Country Home & Lot Loans · Crop Insurance * We support agriculture and rural communities with reliable, consistent credit and financial services, today and tomorrow.